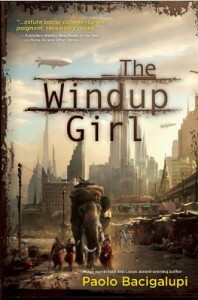 It took me about a 100 pages to get into The Windup Girl but after that the story's pace picked up, I enjoyed it more, and was surprised at the relatively upbeat ending (not Panglossian certainly but more hopeful than you might have thought considering the 350 pages that had gone before). The novel is set in the late 22nd century when the oil-based economy of the West has long since collapsed, replaced by a world largely dependent on animal and man power once more - albeit genetically modified, e.g. megadonts & New People. Much of the world is at the mercy of the "calorie companies," who monopolize the creation and production of the crops that can resist the genetic plagues that have destroyed naturally occurring grains. The only significant part of the planet to have escaped their grasp is Thailand, which ruthlessly destroyed any contamination; hosts a renegade calorie-company scientist; and possesses a seedbank holding the relics of many now extinct plant species. As the book opens Thailand is delicately poised between the Trade Ministry, which wants to open up the kingdom, and the Environmental Ministry, which wants to maintain the isolation and keep the calorie companies out. We follow the lives of 5 people caught up in events: Anderson Lake, a covert ops agent of one of the companies; Emiko, the windup girl of the title; Hock Seng, a survivor of the massacre of the Malayan (sic) Chinese by xenophobic religious fundamentalists; and Captain Jaidee and Lt. Kanya, white shirts, the Environmental Ministry's paramilitary troops. Telling a story from multiple POVs is always problematic, in my view, and I think the book suffers from the inclusion of Lake's and Seng's. The more interesting parts of the book are Emiko's and Jaidee/Kanya's stories, and Bacigalupi loses his focus when we're with the first two. I say this but would point out that I found Hock Seng to be an interesting character. He deserves a novel of his own but his story wasn't all that relevant to this one. The Windup Girl is a good but not great book. Bacigalupi is masterful at creating a believable near future whose features ring true; he's pretty good at creating believably complex characters; and I like the fact that he avoids the dreaded infodump, revealing his world primarily in dialog and inference. It requires a certain exercise of mental muscle on your part but the effort's worth it. I'd recommend the book, especially to those who enjoy near-future, hard SF, and I won't be averse to reading more Bacigalupi if I get the chance.